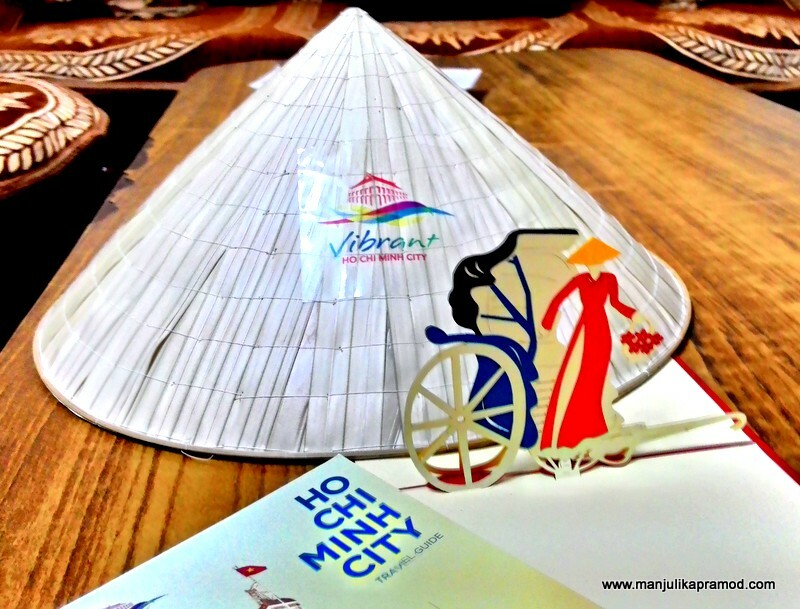 This travel blog post shares some very exciting and helpful travel information about Vietnam which I got to discover at Ho Chi Minh City media meet and road show that happened in Delhi last month. VIETNAM IS ON MY MIND! WHY? The country gets a good footfall from tourists all over the world. Through this event, they personally came around to invite and welcome Indian tourists and travelers to explore the glories of their cities and the country as a whole. Even before I attended this event, VIETNAM has strongly been on my mind for a few months now and I will tell you why. One of my closest pals and a great friend from my last company was putting up in Hanoi since last year and knowing that I am a travel blogger and how much I love to explore new countries, she had been pushing me to plan a visit to meet her. I definitely wanted to make the most of this offer but I couldn’t due to other travel engagements. She visited a lot of places and tempted me with the gorgeous pictures. And now, after this road show of Ho Chi Minh City, I want to go to meet her as soon as possible. 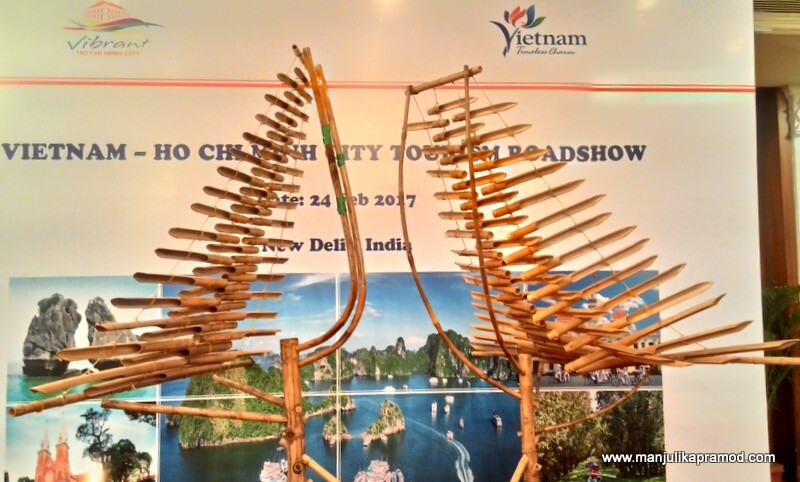 This media meet commenced on a musical note where two beautiful Vietnamese ladies played a wooden musical instrument. The setup was huge and very interesting. It was assembled with flute-like wooden bars. The music was catchy and it got the interest of the audience almost instantly. This way we got acquainted with the artistic side of Vietnam. Next, followed the presentations and interactions. The aim of the event was to introduce some of the best travel and tour operators of Vietnam to the Indian media and woo them with the glories of this South-East Asian country. 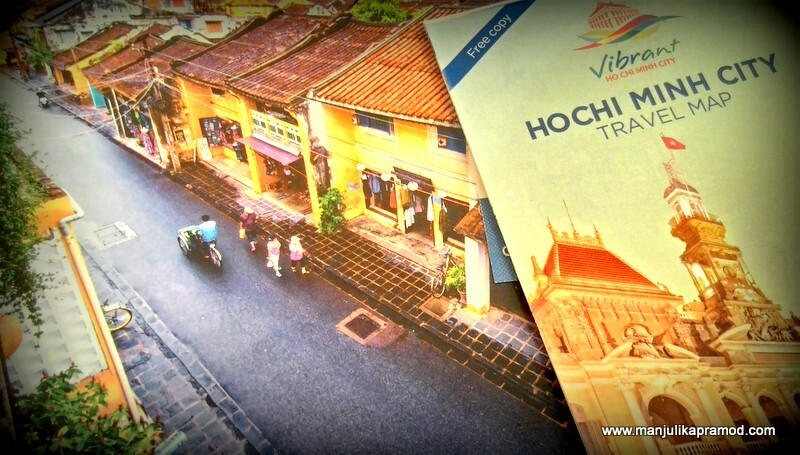 Personally, I did not know much about it and I wanted to know that what Vietnam has to offer me as a travel destination. So each one of them showcased the beauty of Vietnam and later introduced their holiday packages and itineraries. This came to be very helpful to me because this way everyone in the audience learned a number of things about the country, their culture and it’s beautiful locations that must be explored. The t’rung (đàn T’rưng) is a traditional bamboo xylophone. It is used by the Jarai people and Bahnar people in Vietnam. Traveling to new destinations is in vogue these days. A lot of people in my circle are curious about unexplored and uncrowded locations. In my view, Vietnam looks exciting. So here are 15 things that I learned from all the information and travel booklets given to me at the road show. Read on as some of it might interest you too to travel there. 1. First and foremost, India and Vietnam are celebrating 45 years of their cordial relationship. 2. Ho Chi Minh City was initially called Saigon and it is still quite a popular name. It is the largest city by population. The airport is known as Tan Son Nhat International Airport. 3. Hanoi has its own feature as it is not only the capital city but also the culture center of the country. The airport is known as Noi Bai International Airport. One can explore its Buddhist temples, ancient citadels, unique theaters and French colonial architectures along with Hoan Kiem lake, Ngoc Son temple, Ha Noi Old quarter, Dong Xuan market, One Pillar Pagoda. 4. Da Nang is the commercial and educational center of Central Vietnam. It has a well sheltered and easily accessible port including the Old Town Hoi An – UNESCO world heritage center. 5. “Pho” is one of the Vietnamese worldwide famous dish to be relished for sure. 6. More in Hanoi- Ho Chi Minh Mausoleum, his House on Stilts, the One pillar Pagoda, the Fine Arts Museum and Temple of Literature. 7. Mekong Delta is one of the longest rivers in the Souther side of the country. 8. A drive to the Halong Bay via Red River Delta, a cruise on the boat and a visit to its beautiful limestone caves is a must. 9. A visit to Lao-Cai -Sapa is also supposed to be on the itinerary. There is a night train from Hanoi to Lao-Cai. 10. One can hike down to Lao Chai village to meet Tay and Day tribes. Ta Van village is a beautiful place to visit. 11. There are the famous Cu Chi tunnels, 70 kilometers North of Saigon. This experience is about the underground life during U.S.-Vietnam War. There are 200 kms of underground tunnels. 12. Vietnamese cuisine’s common ingredients are fish sauce, shrimp paste, soy sauce, rice, fish herbs, coriandar, Saigon’s cinnamon, bird’s eye chilli, lime and basil leaves. There are many Indian restaurants. Traditional cooking uses fresh ingredients and minimal oil. It is considered to be one of the healthiest. 13. The country has 11 international airports. 14. A very interesting travel option that got my eye was the Vespa Motorbike Cyclo Tour. It is a 2 hours tour on the vehicle that you want (Vespa, Motorbike or Cyclo) drives you a couple of places in Saigon Downtown – Reunification Palace, Notre Dame church, Central Post Office, Opera House, China Town, Traditional Vietnamese Pagoda, Ben Thanh Market. 15. Vietnamese Dong (VND) is the currency. 16. “Tet”, the Vietnamese traditional New Year calls for an official 5 day holiday and it the busiest time for traveling. 17. 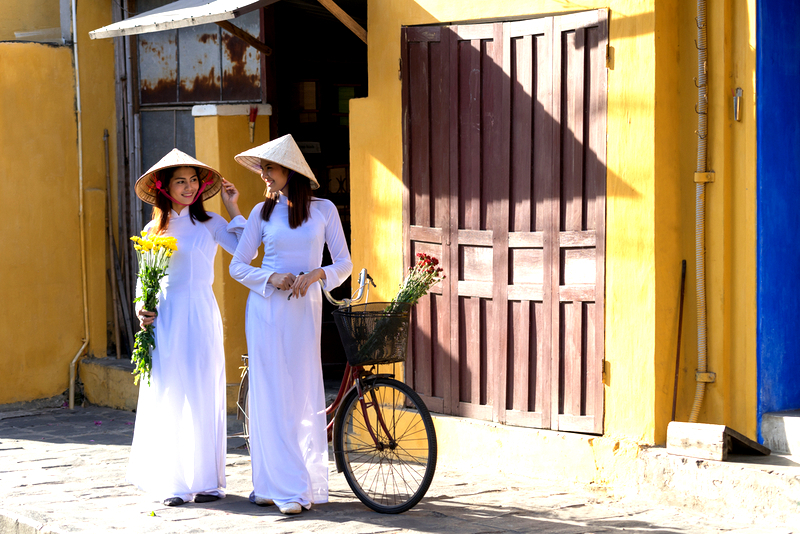 Ao Dai is their famous traditional costume. After the event was over, each one of us was gifted a Non la (leaf hat), a circular cone made of bamboo cataphylls. I love those hats and I am glad I got one of my own. It makes for the style statement of Vietnamese people and they love to wear it throughout the year. I wish to sail on the traditional junk boat of Halong Bay and walk the streets of the ancient town of Hoi An. I can’t wait to experience the energy of Vietnam. Another important point, Vietjet Air will soon be flying from DELHI by mid of the year. I am definitely looking forward to visiting Vietnam this year. Would love to visit after reading this!